I am a 35-year-old woman and I love Bluey. 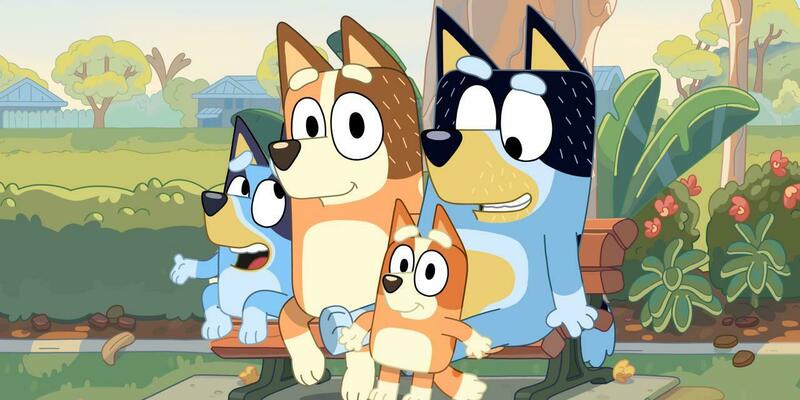 Bluey is an Australian made animated television show for children that follows the adventures of an energetic anthropomorphic six-year-old Blue Heeler puppy named Bingo who lives in an average Australian suburb with her mum and dad and her four-year-old little sister, Bingo. Bluey is made in Brisbane by a local production company called Ludo Studio. The show's creator and writer, Joe Brumm, pitch for the show was for it to be based on his own experiences of being a father of two young girls. Bluey was made in collaboration with the Australian Broadcasting Corporation, BBC Studios, Screen Australia and Screen Queensland. 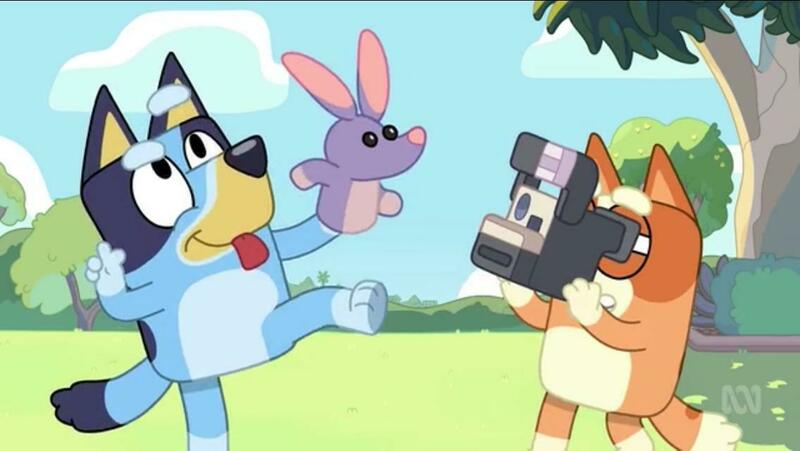 Ever since Bluey premiered on ABC Kids back in October 2018, the show has become one of the most watched and talked about children's television shows in Australia. Bluey's audience has grown so big it is even being watched more than The Wiggles and Play School. On ABC's iView app the show has been streamed over 21 million times, making it one of the most downloaded shows in iView's history. What's so interesting about Bluey is how it has managed to capture the interest of not just children, but adults as well. Everyone really, really likes Bluey. I first heard about this show not from a child, but from an adult who insisted that I watch it. So what is it about this little puppy that people seem to enjoy so much? One of the things that I like about Bluey is how realistic and relatable it feels. Bluey and her little sister Bingo speak like little children and sound like little children and live in a middle-class Australian looking suburb. A central part to Bluey and Bingo's lives are their parents. Bluey's dad, Bandit, is an archaeologist who likes to dig in the ground for bones. He is voiced by Dave McCormack who is the frontman for the Australian indie rock band Custard. Bluey's mum is named Chili and works part-time in airport security. She is voiced by actor Melanie Zanetti. Bluey and Bingo spend a lot of their time exploring their environment and engaging in unstructured play with each other, their friends, and their parents. Bluey and her sister have boundless energy and are always doing things like dancing, dressing up, getting messy, and using their imagination to come up with fun new games to play. Bluey and Bingo are girls, but they are not forced to be cute and play with dolls, which is refreshing. Their gender is mentioned so little on the show, some viewers have even said it took them a few episodes to realise that they were girls. One of the most talked about things about Bluey is the positive relationship that Bluey and Bingo have with their dad, Bandit. In a refreshing twist, the creative team behind the show have abandoned the "bumbling dad trope" and introduced a father who does housework round the house, supports his wife having a job, is patient and kind to his kids, is an equal partner to his wife, and spends more time playing with his children than their mother does. Bandit has been praised for being a better role model to kids and fathers and for not being portrayed as another "idiot" father on television, like Homer Simpson or Peter Griffin. As a parent, I really love how realistic parenting is shown in this show. Bandit loves his kids more than anything, he will happily spend all day playing with them and is often as enthusiastic and silly about playing games as they are. Bluey and Bingo love him dearly, but don't realise that he has made a lot of sacrifices to be their dad. Bandit spends so much time with his kids he has to sneak in moments to watch a bit of the cricket and has so little time to play footy with his friends he dreams about it. And in episodes like Takeaway, when Bandit tries to do something simple like purchase some takeaway food for the family, we see a hilarious and very realistic example of what it is like to try and control kids in a public place. After being told that there will be a small wait for his food, Bandit is left waiting out the front of the shop with his kids. Bluey starts fiddling with a nearby tap and making a mess, Bingo starts asking Bandit lots of questions like "How long is five minutes?" and "Dad, where do rocks come from?" and the girls drop food on the ground and then Bingo announces that she needs to do a wee, putting Bandit into a panic. Man, I've been there Bandit. I've been there. Another episode that stands out to me is The Beach. In this episode Bluey joins his Mum for a long walk on the beach and learns a little but more about her. 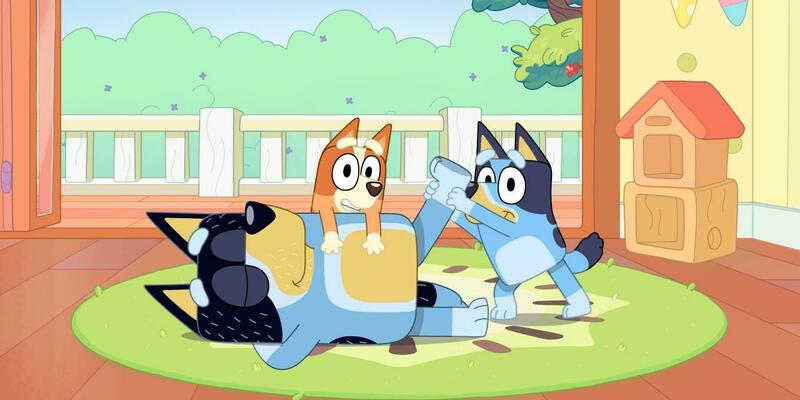 Bluey is such a great show. It's so warm and endearing, I find it kind of relaxing. It's become so popular in our house, every time my four-year-old decides to watch an episode, I hear her sing out "Muuuuuummm…I'm watching Bluey! You wanna come watch it with me?" which always gets a smile out of me. I enjoy Bluey so much, when I'm not watching it with my daughter, I sometimes watch it on my own. It's just that good. For real life. For information about how to watch Bluey click on the link below. Why? Bluey has been a huge hit on the ABC with adults and children. When: Bluey airs on ABC Kids on weekdays at 8am and every episode is available to watch for free on the ABC iView app. Cost: The series is available to purchase as a digital download off the iTunes store with two collected volumes available for under $10 each.